Wednesday June 7th is our launch day. Sunrise is very early hear, currently 4:52 am, meaning it gets light much earlier. We were up and out of bed before 0600, fed and freshened up by 0700 and completing last minute odd jobs prior to launch. At 0830, Wayne brought Atlantic Boat Company’s huge tractor and hydraulic trailer to Tug’n, knocked on our hull and called out that its time to launch. Atlantic Boat can only launch boats about 2 hours before high tide to 2 hours after, so you don’t want to miss that window. The day is perfect - a bright clear sky, 16 degrees C and a very light breeze. No matter how well prepared we are and how highly competent the boat yard staff are, my adrenalin level always jumps when it is time for launch or haul out. Seeing our boat high up in the air on a hydraulic trailer or a travel lift just fills me with nervous excitement. Launch goes without a hitch. Our big Cummins diesel fires up on the first try and seems excited by the prospect of another summer of cruising with us. We idle out into the bay going through a check list of tasks to be sure all is in order. After a short three mile run we are back in the bay to grab a mooring ball. I spend the rest of the day checking further equipment (generator, electronics, water maker etc) completing a tweak here and there to get things working the way I want. Our friends Bob and Jan on Wings get launched a couple of hours later and they are going through exactly the same steps with equipment check outs and solving the occasional head ache. The gentle wave slap on the hull on our first night on the water prevents me from getting the best sleep, but I’ll get used to it over the next few days. Prior to launch, we’d had a couple of happy hour discussions with Bob and Jan about where to start our cruising in Maine. We decided on heading southwest from Atlantic Boat Company to Deer Isle. Last year, friends Lee and Barb, aboard a 37’ Nordic Tug named Encore, spend a few hours with us, marking good anchorages along the New England coast and we are now making use of their guidance. Deer Isle has many possible anchorages and we chose Pickering Cove as it will offer good protection when the forecast strong northerly winds arrive early Friday. The anchorage is a leisurely 9 nautical mile trip past many gorgeous waterfront homes. Lobster fishing seems to be thriving as we zig and zag our way along our intended route dodging hundreds of lobster pot floats. Following a straight line is absolutely impossible and our autopilot is getting a break as hand steering is the only way to avoid running over these floats and getting one of their lines wrapped around our prop shaft. I certainly don’t want to have to get in that 11 degree C water to do a repair. Pickering Cove was lovely, with a few fantastic homes along the shoreline and only one large sailboat on its private mooring ball, there was plenty of room for us to anchor. This was our first anchoring of the season and we were not as well prepared as we should have been. We went through the mental calculations on water depth, plus tidal range to sort out the length of anchor rode we needed. But, we didn’t have our wash down pump working so when our first attempt at anchoring left us too close to a lobster pot float, without the wash down pump, we got lots of mud on deck. I scurried to get the wash down hose in place and turn on the pump only to realize the connection to the output side of the pump was not attached and sea water was being sprayed all about in our bilge. After successfully anchoring, I had quite a mess to clean up. The prevailing southwest wind caused a minor swell in the anchorage until the wind swung around to the north. In the afternoon, the bright sunshine gave us a brief high temperature in the low 20’s and we enjoyed a couple of hours in the cockpit doing some bird watching, reading and having a happy hour refreshment. After a lovely dinner and showers, we enjoyed a movie on our tv before an early night. Friday June 9, 2017. We woke to a chilly 9 degrees, wind and rain (as was forecast). We stayed in bed until almost 0800 hours. As planned, we were underway by 1030 hours for a lunch stop at the town of Stonington on Deer Island Thorofare. It’s a picturesque town with plenty of white houses on a hill sloping down to the water where the bay is filled with lobster boats tending to all those traps we do our best to dodge. Stonington’s residents initially made their living harvesting granite at nearby quarries and running sardine canneries. Lobster fishing and tourism now drive the community’s economy. There is no real visitor docking here, but we managed to get approval to tie up at “The Landing” dock for a few hours, in the pouring rain, allowing us to walk into town fur lunch at the Harbour Cafe. We split a bowl of fish chowder and a plate of haddock and chips, that was most welcome after our outing on this damp and chilly morning. After lunch, we headed off further west to Perry Creek Cove on Vinalhaven Island, at the south end of the famed Penobscot Bay. As we cruised along, admiring the shoreline, the forests and the lovely homes, we were struck with how similar it looks to our home cruising area on Georgian Bay. The big difference of course is the salt water, the tides and the look of the rugged, seaweed strewn shorelines at low tide. But at high tide, one could easily believe you were cruising Georgian Bay. Perry Creek Cove is a lovely, well protected anchorage which we were pleased to share with two other boats and of course a bunch of lobster trap floats. Vinalhaven Island's more recent history since the arrival of Europeans some 250 years ago, was focused on fishing, shipbuilding, logging & shipbuilding. Later, high quality granite was discovered in 1826 and Vinalhaven became one of Maine's largest quarrying centres for the next century. Today, the island's residents are focused on fishing and lobster and the island is also home to wealthy north easterners mostly from Boston, New York and Philadelphia. Maine’s coastline has many islands, coves and channels and each one needs a name. It has been quite fascinating getting acquainted with the area as we sort out our cruising plans and reading the names one thinks those responsible for naming them must have had quite a lot of fun. Check out these names: Eggemoggin Reach; Naskeag Harbour; Burnt Coat Harbour; Isle au Haut; Mount Desert Island (that locals pronounce it Mount Dessert, probably due to the French origin of its early European inhabitants); Brimstone Island; Crotch Island. Trust me, there are many more entertaining names. I’m sure there is a story behind each one and I plan on doing some digging to see what I can find out. Saturday June 10, 2017: This morning was one of those days that is just picture perfect. Cloudless, mirror calm water, silent and breathtakingly beautiful reflections of the tree lined shore. The rain/dew mixture on deck begged for a wipe down, which I did before breakfast, pausing every few minutes to admire the beauty. A mom & pop small lobster boat swung by to tend to their traps in an efficient and orderly manner. By 1000 hours, we were underway for a new anchorage in southerly Penobscot Bay called Pulpit Harbour on North Haven Island. Our route took us between Vinalhaven Island and North Haven Island, past many gorgeous properties with huge homes (summer homes?) all in splendid condition and many with elaborate piers with ramps and floating docks, which is an engineering challenge with 10’ tides. Pulpit Harbour is reportedly a huge favourite among the boating community and we found it littered with mooring buoys. Fran and I remembered it from a one week schooner cruise we had aboard The Heritage in 1997. We had anchored in Pulpit Harbour and sailed one of their lovely wooden tenders about the harbour. Upon arrival, we approached a sailboat with a New York registration, to ask for guidance about the mooring balls and we were encouraged to pick up any of the mooring balls as most owners had not launched their boats yet. Come July, it would be a different story and the sparsely populated anchorage would likely be packed. So, we happily picked up a mooring and settled in. Shortly after, our new sailing friends Nick and Jennifer came by to tell us about a public floating dock we were allowed to use and a recommended shore walk to take. Nick and Jennifer are retired from the hectic New York advertising business and in retirement, Nick is an artist and Jennifer writes and publishes children’s books. Jennifer Berne has published four books: Manfish; Calvin Can’t Fly; Nighty-Night, Sleep Tight; and On a Beam of Light. We completed a lovely walk with Nick and Jennifer to the North Haven Grocery Store and Fran and I split a dish of ice cream - mmmmm. I think this is our first day where the temperature was warm enough to truly desire an ice cream.Afterwards, we did a few chores, enjoyed a game of Five Crowns over Happy Hour and then barbecued a pork tenderloin for dinner as the wind died and the sun set behind the Camden Hills off in the distance. Perfect. Sunday June 11, 2017: It’s another beautiful, sunny morning. We were up by 0530, woken by the very early sunrise. Waking so early also goes together conveniently with falling asleep shortly after 2100 hours (9pm). Strong winds are forecast for later this morning, so we are on our way by 0740 for a short, 9 nautical mile run to an anchorage at Warren Island by Seven Hundred Acre Island. Warren Island is described as a wild, remote State Park. The State maintains 9 mooring balls that are rented on the honour system for $20 per night. Shortly after lunch, Wings launched their dinghy and ferried the four of us to the dinghy dock. We met the Park Warden who gave us a map of the island in exchange for our fee and warned us about protecting ourselves from ticks and lime disease, which we’d prepared for. Warren Island used to belong to the William Folwell family, wool manufacturers from Philadelphia. Their dream home was completed over 10 years at a cost of $75,000 and was completed in 1901. 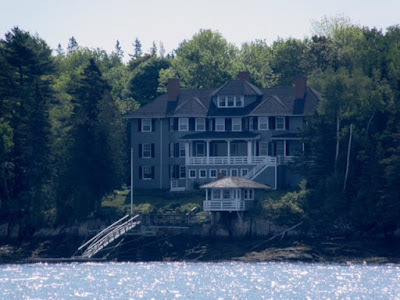 It was built from spruce logs cut on the island and it included a large dining room, kitchen, ball room and 27 bedrooms all connected by a balcony. Summer days were filled with sailing, fishing, clambakes and visits to the mainland, but the highlight of every summer was their masquerade ball. All this activity came to an end in 1919 when the summer home was destroyed by fire. The property was donated to the state for a park. Remnants of the summer home’s foundation are still evident on the property. A walk around the well maintained property perimeter shows off its wonderful views of Penobscot Bay. Today reached a high of 25 degrees - how perfect is that.